Where how it is done is as important as having it done. 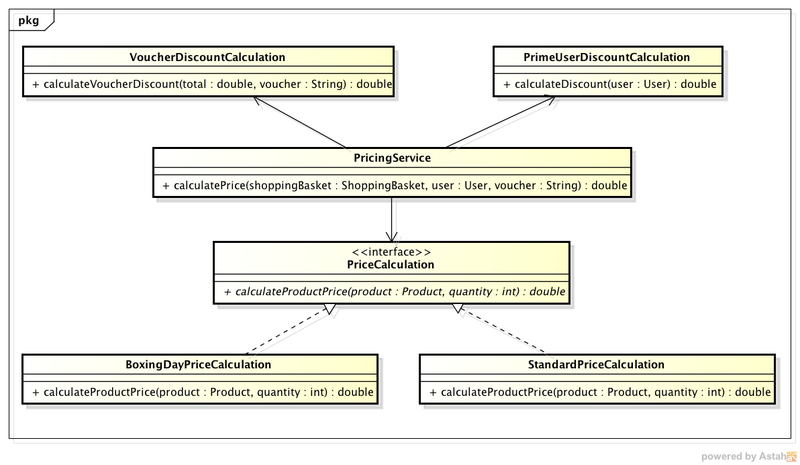 Let's have a look at the VoucherPricingService, that now is the only concrete class at the bottom of our hierarchy. Note that it uses the VoucherService class to calculate the voucher value. Once thing to notice is that the User parameter is not used for anything. So let's remove it. Now it is time to user the Extract, Inject, Kill on the VoucherPricingService. 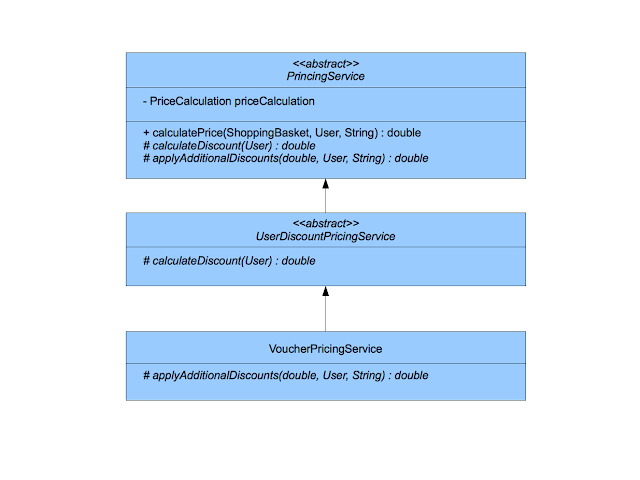 Let's Extract the content of the VoucherPricingService.applyAdditionalDiscounts(double, String) method and add it to a class called VoucherDiscountCalculation. Let's call the method calculateVoucherDiscount(). Of course, let's do that writing our tests first. They need to test exactly the same things that are tested on VoucherPricingService.applyAdditionalDiscounts(double, String). We also take the opportunity to pass the VoucherService object into the constructor of VoucherDiscountCalculation. If you noticed, when doing the extraction, we took the opportunity to give proper names to our new classes and methods and also to pass their essential dependencies to the constructor instead of using method injection. Let's now change the code in the VoucherPricingService to use the new VoucherDiscountCalculation and see if all the tests still pass. Cool. All the tests still pass, meaning that we have the same behaviour, but now in the VoucherDiscountCalculation class, and we are ready to move to the Inject stage. Let's now inject VoucherDiscountCalculation into PricingService, that is the top class in the hierarchy. As always, let's add a test that will test this new collaboration. And here is the changed PriningService. 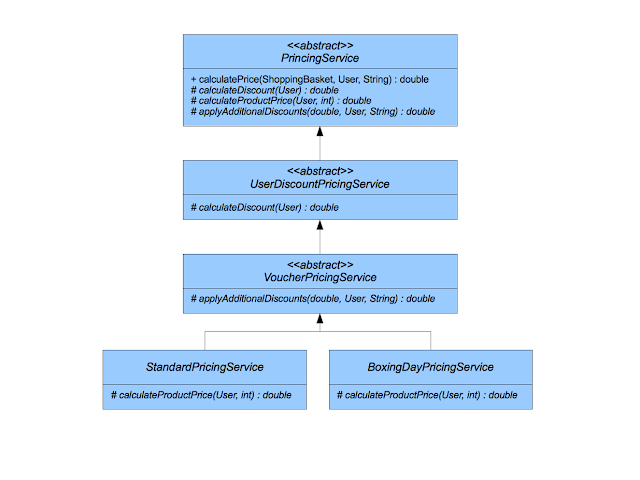 Now it is time to kill the VoucherPricingService class and kill the PricingService.applyAdditionalDiscounts(double total, String voucher) template method, since it is not being used anymore. 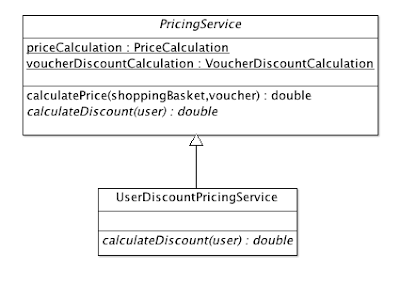 We can also kill the VoucherPricingServiceTest class and fix the PricingServiceTest removing the applyAdditionalDiscounts() method from the testable class. So now, of course, we don't have a concrete class in our hierarchy anymore, since the VoucherPricingService was the only one. We can now safely promote UserDiscountPricingService to concrete. Since the approach was described before, there is no need to go step by step anymore. Let's have a look at the final result. The cool thing about the final model pictured above is that now we don't have any abstract classes anymore. 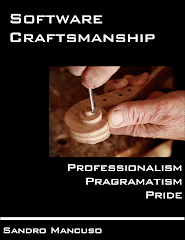 All classes and methods are concrete and every single class is independently testable. Note: For this three part blog post I used three different approaches to drawing UML diagrams. By hand, using ArgoUML and Astah community edition. I'm very happy with the latter.